Click here for a detailed zone map. Remember those cool, crisp, New England fall days and the crispy crunch of an apple just picked? Share these memories with faraway friends, college students, business associates (or yourself) by sending a 'bit of New England'. It's the perfect gift for birthdays, holidays, or just because! Here at Applecrest, we ship only the freshest, finest apples, picked here in our own orchards at the peak of ripeness. Only the largest, most perfect apples are selected and then carefully hand-packed in foam cells in our handsome gift boxes. We grow and ship 40 varieties of apples including New England faves like McIntosh, Cortland, Macoun, Mutsu, and Honeycrisp. We welcome you to customize your gift pack with locally produced cheese, maple syrup, jams, or other gift items and we are always happy to include a personalized message on a hand-written card. We guarantee each box we ship and we ship anywhere in the world. BELOW IS A LISTING OF OUR GIFT PACKS. *Call or email us to place an order 603.926.3721. 16 Extra-large, extra-fancy apples of a single variety of your choice. For premium cultivars (Honeycrisp, Macoun, Baldwin), please add $5.00. 16 Extra-large, extra-fancy apples of up to three varieties of your choice. For premium cultivars (Honeycrisp, Macoun, Baldwin), please add $5.00. 48 Extra-large, extra-fancy apples of up to three varieties of your choice. 14 Extra-large, extra-fancy apples, plus 1 quart Grade A New Hampshire Maple Syrup. 14 Extra-large, extra-fancy apples, plus 2 lbs, Aged Wicked Sharp Cheddar Cheese. All Applecrest gift packs are shipped worldwide via FedEx. Sorry, we cannot ship to P.O. boxes. 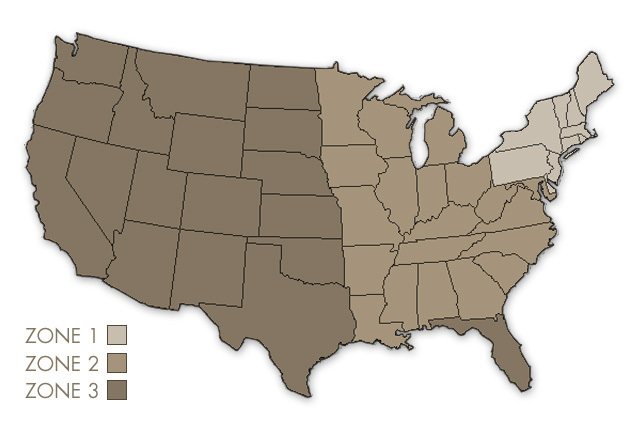 Our zone map outlines the various states, shipping zones and associated costs. To ensure optimum quality and the safe arrival of your gift pack, our perishable fruit is hand-packed and shipped from our farm on Mondays through Wednesdays. Please note that Zone 3 states ship on Mondays only. Shipments to Alaska, Hawaii and international destinations may require additional shipping and handling fees. * If placing an order via email or by phone, please be prepared to provide specific information necessary to process your order. Such information is likely to include your name, telephone number, billing address, email address, the name and shipping address of the recipient, and financial information such as your credit card number and expiration date. Applecrest will not sell or give away any information concerning our customers: past, present or future. The timing of each cultivar's ripening and maturity can sometimes vary greatly due to the whims of Mother Nature. Should your requested variety(s) be unavailable due to timing or scarcity, we will provide an appropriate substitution.